Fishing is one of the most popular recreational sports in the world. Almost any body of water on the planet can yield fish, making a day of fishing acessable to almost anyone. Proper fishing equipment is important to a successful fishing trip. Fishing poles, hooks, bait and a net should be included in any good fisherman’s gear. Fishing nets can be made at home, making them one of the cheapest fishing tools available. Measure the width of the wooden dowel. The dowel will be used as the handle of the net, so make sure it is a sturdy, solid section of wood. Drill a hole in the end so that you can attach the dowel to the hoop. Mark the width of the dowel on the PVC hoop, and then cut that section out with the saw. This will allow you space to thread on the netting material and then attach the handle. Fold down two inches of the netting and then sew that fold into a fabric tube. You want to leave both ends of the tube open to make it easy to thread the net onto the frame. Place the netting on a flat surface and then fold the entire net in half. Sew the sides of the netting together, stopping at the bottom of the tubing. This should create a solid circular net with no gaps. Slip the netting over the PVC pipe. Be sure to check for holes in the netting that are big enough for fish to escape through. Drill a hole in the two ends of the PVC hoop. Make sure the holes in the PVC line up with the holes in the dowel. Slide a bolt through the PVC and dowel, then tighten firmly. Hold the dowel straight while you tighten the bolt. This is done so the handle on your newly constructed fishing net is set properly. 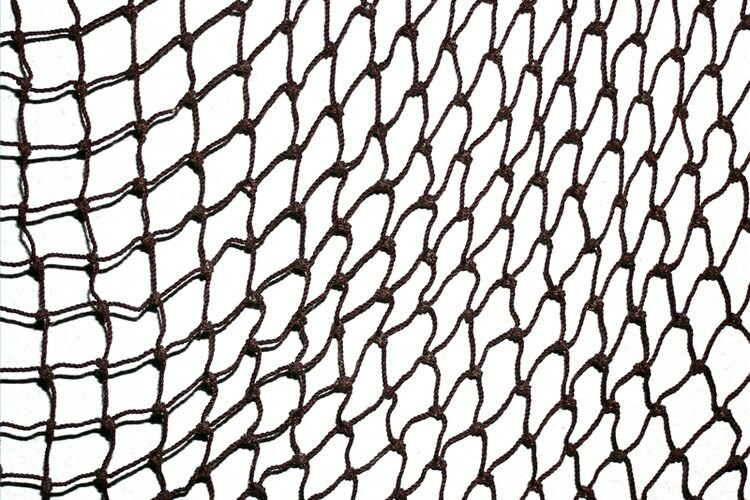 Use a good quality netting to construct the net. Many nettings will crack and tear after a few uses. Do not use tools without proper protection. Use hand and eye wear to protect against hand and eye injury.